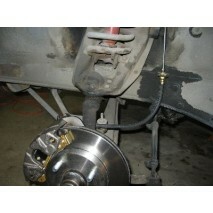 Convert your classic 1949-53 Ford to front disc brake with these brackets (made in the USA). &..
Bolt pattern is 5 on 4-1/2", not stock Mercury Convert your classic 1954-56 Ford or Mercury to fr.. Easily convert your classic 1957-68 full size Ford or 1961-68 Mercury to front disc brake with these.. Easily convert your classic 1958-60 Ford Thunderbird to front disc brake with these brackets. They a..
Why scare yourself constantly with ancient drums when you can easily and very economically convert y.. Convert your 1960-66 drum-spindled Mercury or Ford 4 lug to 5 lug disc brake with our AutoCAD e.. Easily convert your classic 1961-62 T-Bird to front disc brake with these brackets. They are Au..
We now offer our budget solution to stopping your 1961-67 Ford Econoline. You can easily and ..
We now offer an excellent budget solution to stopping your 1962-69 Ford Fairlane, Mercury Monte..
We now offer an excellent solution to stopping your 1962-69 Ford Fairlane, Mercury Montego or C..
We now offer an excellent solution to stopping your 1963-73 Ford Mustang, Falcon, Mercury Monte.. Easily convert your classic 1963-64 T-Bird to front disc brake with these brackets. They are AutoCAD..
Rotors for MUX bracket kit. Sold per pair. .. This pair of ready made hubs eliminate the need to rework your old drum hubs are designed to work wi..